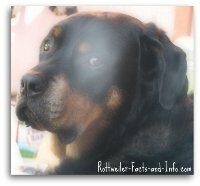 The Male Rottweiler - What makes him so unique? 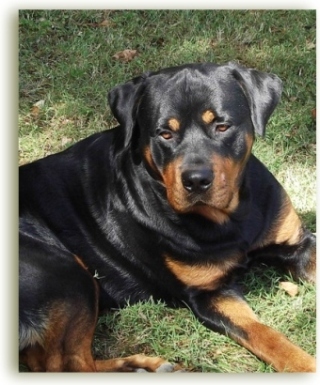 Well a male Rottweiler can be more difficult to own than a female in some respects. What I mean by that is male dogs have a lot of testosterone. This can make it a bit more difficult to be around other male dogs. He can also tend to be a bit more territorial than female Rotties. The picture you see above is of a boy named "Moose", and he is one of the most beautiful dogs I've ever seen. He lives in Ohio with his family that consists of mom, dad and 2 siblings (all of which have 4 legs). 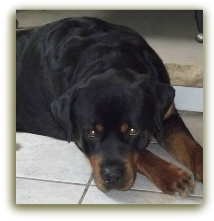 A typical male Rottie will weigh somewhere between 100 and 130 pounds. His height will typically be between 24" and 27". Healthy male's will tend to live between 8 and 11 years. Just like humans, females tend to live a bit longer. 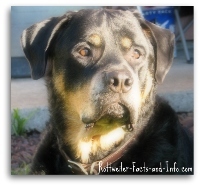 Contrary to popular belief, male Rottie's are not any more or less aggressive than females. Proper socialization is especially important with Rotties - make sure your training program includes good responsible socialization! 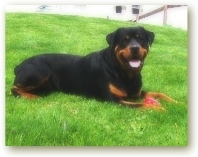 Should a Male Rottie be neutered? A male dog has a few different body parts than a female (just like humans). Two of those different parts are the testes and the prostate. 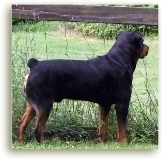 Unless your dog is of very good breeding stock, and a good candidate themselves, a male dog should always be neutered. Neutering a male dog literally erases the chance of him getting testicular cancer. Neutering also reduces a boy's testosterone levels and tends to make him less territorial. He also won't be nearly as inclined to mark his territory as much and won't have the urge to seek out the ladies who haven't been spayed. 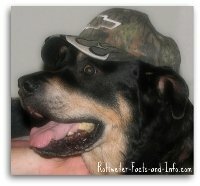 Knowing that a male Rottie will likely weigh over 100 pounds and be very smart and strong-willed, you must do proper training. The truth is that just like human children, dogs need rules to follow that they understand. They need to be taught proper behavior for all situations. This really makes everyone's life easier!